This morning was 35 degrees, rainy, hilly, and I couldn't have done it without the great group of women I ran with today. 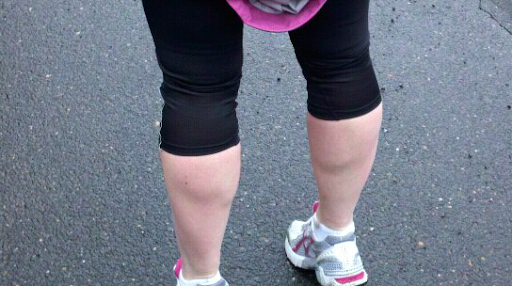 As I was running I received a few comments on how cut my calves looked. The first thing that came to mind and I said out loud was: "yes I have big calves". The response I received was: "I wish I had your cut calves". It's funny how what we have others want and vice verse (I would prefer smaller less cut calves however they do come in handy on the hills). It's funny how perceptions can very greatly from one person to the next. The picture in this post was taken after the run. I tried to flex for the camera to see what my running partners were talking about. If I can get a better picture I'll post one later. Today I am wearing running tights for the first time btw - and I love them! I don't look as bad as I thought and they feel great on. Ladies you keep me going. Keep moving no matter what!